Something beautiful and cozy and snuggly happens at least once, and usually twice a day in our house. A giant warm fluffy sleep bomb goes off at bedtime and for naps. It’s glorious and enticing. My kids get excited for sleep. We jump under the covers and giggle and cuddle (and hope that nobody farts). We talk about our day and say silly things. Maybe read a book or two. We talk and giggle some more. Then, usually, right when I start to get comfy, someone will shout out that they have to go to the toilet… sigh… up we all go. To the toilet, and then jump right back in bed, where we can cuddle again. Goldie, (almost 2) falls asleep on my right shoulder, and Margo (4) falls asleep somewhere on my left side, either on my shoulder too, or while I’m scratching her back, or just simply flops over and drifts off on her own. Sometimes there are no giggles… sometimes there is crying and kicking and screaming! After a big day, then the giggles turn into negative emotions that need to be released. And, that’s ok too. I know that it just needs to come out before they can drift off to sleep. 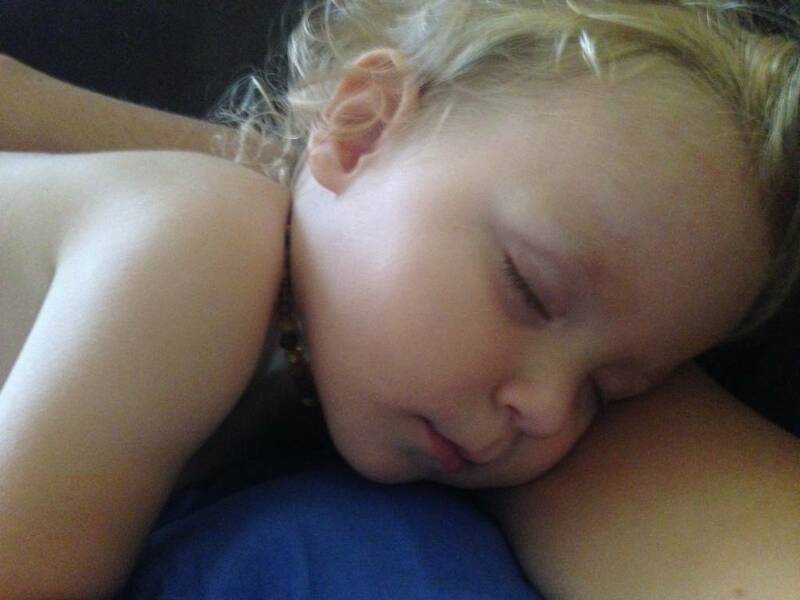 When the crying is over, they fall asleep peacefully… in my arms… or right beside me. The sleep bomb starts just as they’re about to fall asleep. I can feel the whole energy change. My own consciousness starts to slip… but it doesn’t slip too much… I have this sixth sense and I can’t fall asleep fully until I know they’re asleep. My mouth parts a little as I start to doze off and juuuust as that happens, I come back from that sleep bombing bliss because I know that at that exact moment, they have just fallen asleep. I listen to their breath, I see how their chests are rising in a certain rhythm, and I know for sure that they’re fast asleep. They almost always fall asleep within seconds of each other. Usually, then I’ll pass out too. Sometimes, if I have something urgent to do (like write a brewing blog post) I can muster up enough strength to peeeeeel myself out of that sleep bomb trap. That is the sleep bomb ritual that happens every day, and I love it. If you could hear it, it would sound like a cloud of soft fluffly sleepy dust that exploded a hundred miles in every direction…pooof… Goodnight. Posted in Co-Sleeping and tagged co-sleeping. Bookmark the permalink. I love your description of bed sharing! My husband and I have had our 8 month old son in our bed since he was a month old. I can tell that most people think it’s lazy or unsafe, but I did more research on the subject before we started than I assume most people do before putting a baby in their own room. Sometimes I get a little frustrated nursing him back to sleep every 2-3 hours, but I much prefer that over a baby that sleeps through the night in his own room. I mean, I never once have to wonder if he’s still breathing! And it’s absolutely precious when they get all tired and giggly right before they fall asleep : ) I would hate to miss that! I always think of all the moments I haven’t had to miss because of co-sleeping! If you think he’s waking up a little more than ‘normal’, have a look into cry in arms… sometimes, they have a bit of pent up emotions to release and tend to wake up a lot at night if they’re restless. Did you do anything different when your second came along? We’re pregnant with our second and still bed sharing with our 20 month old. He’ll be 2 once the baby comes, but I seriously am not ready to stick him in his own bed yet. Nope, we didn’t do a thing. We have a toddler bed smooshed next to ours and my big kid sleeps in there right next to us if we run out of room. Congratulations by the way! Oh, also, they seem to sleep through each other’s noises too! It’s all the sleep bomb energy, isn’t it?! Hard to resist! It is so precious, I know it seems insane sometimes, especially if they wake up all night! I co-sleep too with my 9 month old baby. It was not my plan but ended up doing it. Her bed is still smoking new , money spent unwisely!!! Maybe it’s time for me to sell it on ebay wish all its accessories.